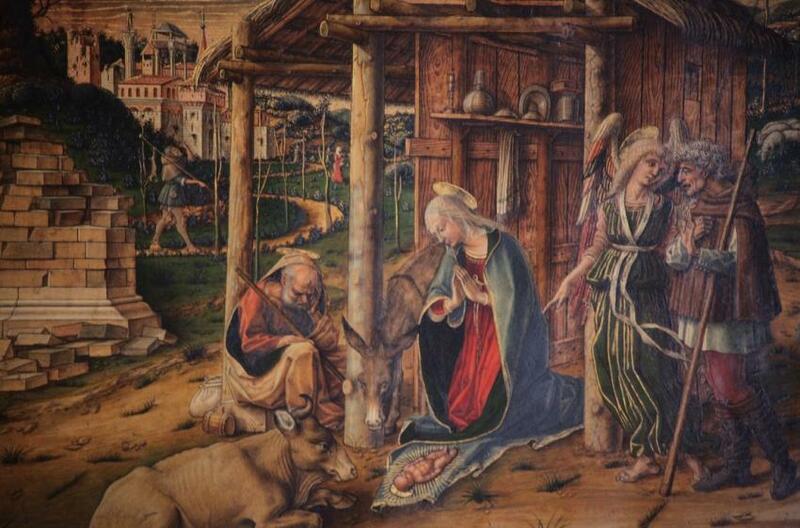 Carlo Crivelli (c. 1435–95) was born in Venice, and was said to be a pupil of Jacobello del Fiore and have worked in the workshop of the Vivarini; he later went to Padua and studied under Squarcione, where he came under the influence of Mantegna. His works combine Late Gothic decorative influences with an easily recognizable personal style that emphasized line, with none of Giovanni Bellini's characteristic 'softness'. Crivelli left Venice for good around 1458 and spent most of the rest of his life around Ancona in the Marche, developing his distinctive style, keen on luminous, almost 3D perspective, exacting detail, crystalline forms, garlands and oddly, cucumbers, which feature in many of his paintings of the Madonna. Most of his works are elsewhere, but he did leave Venice a beautiful Annunciation in the Accademia.